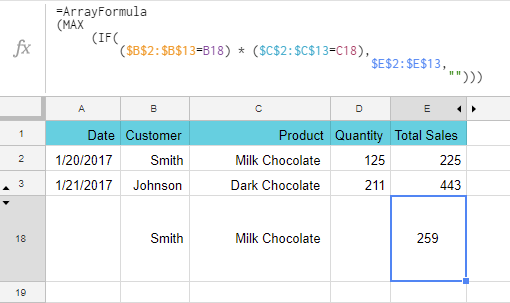 Today I'm going to bring formulas in Google Sheets to the table. I'll start with elements they consist of, remind you how they are calculated, and tell a difference between plain and complex formulas. First things first - to build a formula, you need logical expressions and functions. A function is a mathematical expression; each with its own name. 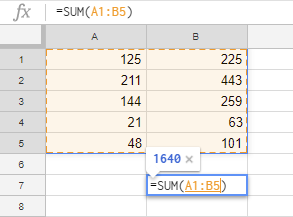 For Google Sheets to know you're about to enter a formula rather than a number or text, start entering an equal sign (=) to a cell of interest. Then, type the function name and the rest of the formula. Tip. You can check a complete list of all functions available in Google Sheets here. Each function requires data to work with, and cell references are used to indicate that data. To reference a cell, alphanumeric code is used - letters for columns and numbers for rows. For example, A1 is the first cell in column A. The dollar sign ($) is what changes the reference type. To switch between relatives and absolutes quickly, just highlight any cell reference and press F4 on your keyboard. At first, your relative reference - A1 - will change into absolute - $A$1. Press F4 once again, and you'll get a mixed reference - A$1. On the next button hit, you'll see $A1. Another one will return everything to its original state - A1. And so on. Once moved, relative cell references change according to the destination cell. For example, B1 contains =A1. Copy it to C2 and it will turn to =B2. Since it was copied 1 column to the right and 1 row below, all coordinates have increased in 1. If formulas have absolute references, they won't change once copied. They always indicate one and the same cell, even if new rows and columns are added to the table or the cell itself is shifted someplace else. Thus, to prevent references from changing if copied or moved, use absolute ones. Constant values in Google Sheets are the ones that cannot be calculated and always remain the same. Most often, they are numbers and text, for example 250 (number), 03/08/2019 (date), Profit (text). These are all constants and we can alter them using various operators and functions. Sometimes, though, you have to change the constants manually. And the easiest way to do that is to place each value into a separate cell and reference them in formulas. Then, all you need to do is make changes in a single cell rather than in all formulas. To get 700 instead, simply change the number in B2 and the result will be recalculated. As the name suggests, these are used to perform math calculations such as adding, subtracting, multiplication, and division. As a result, we get numbers. Comparison operators are used to compare two values and return a logical expression: TRUE or FALSE. All operators are of different priority (precedence) that defines the order of formula calculations and, most often, affects the resulting values. Each formula in Google Sheets handles its values in some particular order: from left to right based on operator precedence. Operators of the same priority, e.g. multiplication and division, are calculated in the order of their appearance (left to right). To change the order of calculations within the formula, enclose the part that should come first into brackets. Let's see how it works. Since multiplication takes the lead and addition follows, the formula will return 17. The formula adds numbers first, then multiplies them by 3, and returns 27. 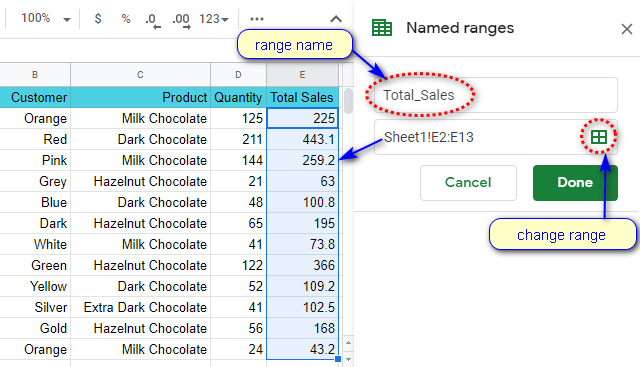 Did you know you can label separate cells and entire data ranges? This makes processing large datasets quick and easy. Besides, you will guide yourself within the formulas much faster. Suppose you have a column where you calculate total sales per product and customer. Name such a range Total_Sales and use it in formulas. Note. 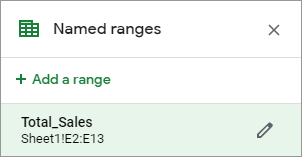 You can't create named ranges from non-adjacent cells. Go to Data > Named ranges in the sheet menu. A corresponding pane will appear on the right. Set the name for the range and click Done. Can contain only letters, numbers, underscores (_). Should not start from a number or from "true" or "false" words. Should not contain spaces ( ) or other punctuation marks. Should be 1-250 characters long. Should not tally with the range itself. If you try to name the range as A1:B2, the errors may occur. If something goes wrong, e.g. you use space in the name Total Sales, you'll get an error right away. The correct name would be TotalSales or Total_Sales. Note. Named ranges are similar to absolute cell references. 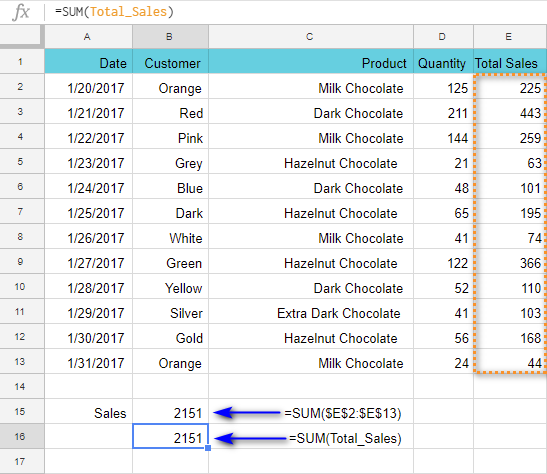 If you add rows and columns to the table, the Total_Sales range won't change. Move the range to any place of the sheet - and this won't alter the results. Formulas can be simple and complex. As soon as additional functions and operators appear, or the order of calculations becomes a bit more complicated, the formula becomes complex. Complex formulas may include cell references, multiple functions, constants, operators, and named ranges. Their length can be overwhelming. Only their author can "decipher" them quickly (but usually only if it was built not more than a week ago). There is a trick to make your formulas look comprehensible. You can use as many spaces and line breaks as you need. This won't mess with the result and will arrange everything in the most convenient way. Can you agree the first way is better? Next time I'll dig deeper into building and editing formulas, and we'll practice a bit more. If you have any questions, please leave them in the comments below.